We work with data presented in the various formats every day. From my point of view, one of the most convenient formats for presenting numerical data is a graph. Users like graphs, especially interactive ones, because they are beautiful and fun – in contrast to dull static tables. There are many solutions to render beautiful interactive graphs in web apps, but today we will discuss something special: a solution built for Rails that makes rendering graphs a breeze. This solution is called Chartkick and it was built by Andrew Kane. Chartkick can work with Google Charts, Highcharts, and Chart.js. It has many options for customization and also has a bunch of supporting libraries like groupdate, hightop, and active_median. In this article we will discuss how to integrate Chartkick into a Rails app, render various graphs, customize them, make them load asynchronously, and how to further power up your code with groupdate and hightop gems. The working demo is available at Heroku. For this article I’ll be using Rails 5 release candidate, but the provided code examples should work with Rails 4 and 3 as well. This will be an intermediate table to establish a many-to-many relation between sporters and competitions. place (integer) – which place did the sporter take. For this demo, we’ll suppose that this column may take values from 1 to 6. So far so good, but to render charts we will obviously require some sample data, so let’s add that now. This will add totally random countries so don’t be surprised if you’ll end up having Antarctica or Sao Tome in your table. Here we use Faker to generate a sample name. Notes that we override the created_at column pretending that a competition took place some years or months ago. Chartkick supports both Google Charts and Highcharts and Chart.js (starting from version 2.0 this is the default adapter.) For this demo I’ll be using Highcharts, but the installation process of Google Charts is very similar. That’s pretty much – we can now render charts. For starters, let’s display a bar chart illustrating sporters’ ages. We simply group sporters by age and calculate the number of items in each group. Really simple. You are probably wondering how to define settings for your graph to give it a name, adjust width, height, and other stuff. That’s easy as well – some settings are being passed as arguments directly to the bar_chart (and other similar methods), other are being set inside the :library option. :library contains library-specific settings. Here we are preventing decimal numbers from appearing on the Y axis (obviously, we can’t have 2,5 sporters aged 20) and give it a name. X axis also has a name defined. On top of that, provide the name for the whole graph (it will appear at the bottom by default). Highcharts has loads of other options available, so be sure to browse its documentation. Also note that settings can be defined globally as well. If your database has a lot of data to process in order to render a graph, the page will load slowly. Therefore, it is better to render your graphs asynchronously. Chartkick supports this functionality, too. All you have to do is create a separate route and a controller action, then use this route inside a view. Note that it requires jQuery or Zepto.js to be present. Now your chart will be loaded asynchronously allowing users to browse other contents on the page. The @sporters instance variable is not needed anymore, so you can remove it from the index method of StatisticsController. Note how the result hash is being constructed – the key is the country’s name and the value is the total number of sporters. Reload the page and observe the result! We take all the countries and use map to construct an array of data. Inside, find all the sporters from this country who took a certain place. joins is used to join with the competition_results table because information about the place is stored there. Then simply use where and count to get the desired value. Then, as we’ve already seen, assign the country’s name for the :name and the places hash for the :data. As a result, an array of hashes will be created. The last chart type we will tackle today is the line chart. To demonstrate it, let’s display how many competitions were held each year. :crosshair option is used to display a helpful crosshair following the user’s pointer. Now we need to create a new controller action, but how are we going to group competitions by year and count them? Of course, we may construct our own query, but the author of Chartkick already took care of it and crafted a handy Groupdate gem. As the name suggests, it allows you to group records by year, month, day, and more. It supports timezones, ranges of dates, formatting, ordering, and other fancy stuff, so it is a nice solution to use with Chartkick. The only problem with Groupdate is that it does not support SQLite3, so you’ll have to user some other DMBS. For this demo I’ll be using PostgreSQL. Please note that if you decide to use MySQL, timezone support must be installed as well. Don’t forget to create a database (rake db:create) prior to performing those commands. Looks great. The :format option allows you to provide the format for the keys. As long as we want to display only the years, I used %Y. The full list of available directives can be found in the official Ruby documentation. Reload your page once again and observe the final result. If you are not satisfied with how the graphs look like, play with the display settings found in the Highcharts documentation. 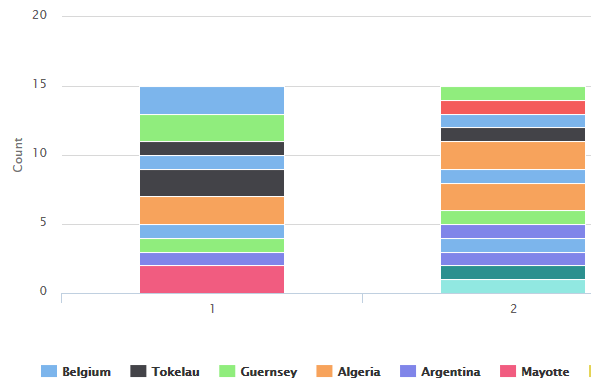 In this article we’ve discussed Chartkick – a great gem to simplify chart rendering. We tried using various types of charts, made them loading asynchronously, and also employed additional gems, like Groupdate and Hightop. Of course, there is more to these gems, so be sure to browse their docs and experiment further with the code. As always, feel free to post your questions and feedback. Happy charting and see you soon!